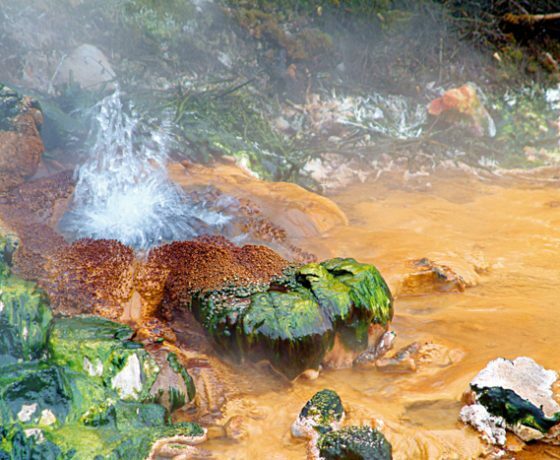 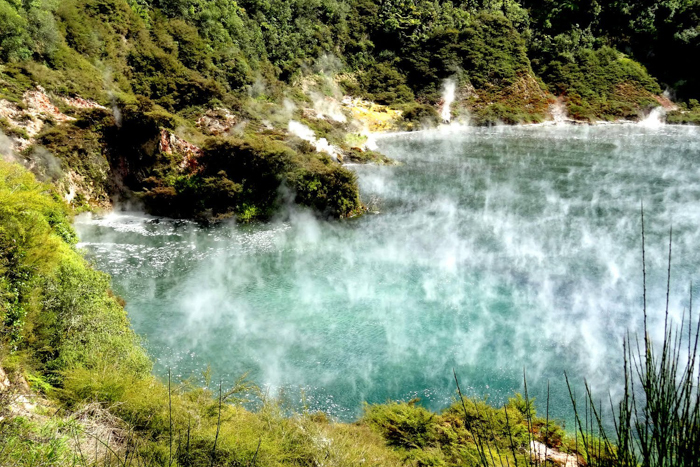 Discerning travellers looking for things to do in Rotorua know that Waimangu Volcanic Valley is the ultimate geothermal experience, conveniently located 20 minutes south of Rotorua or 45 minutes north of Taupo. 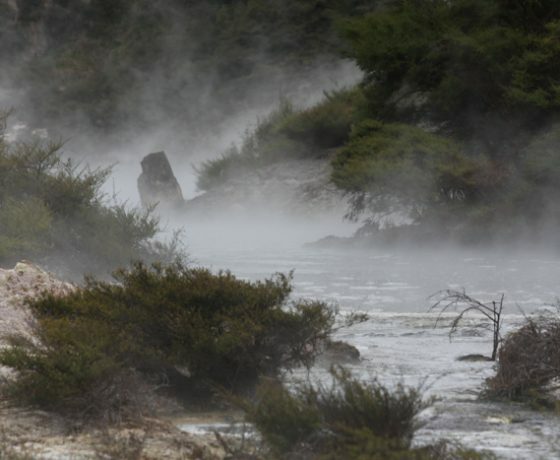 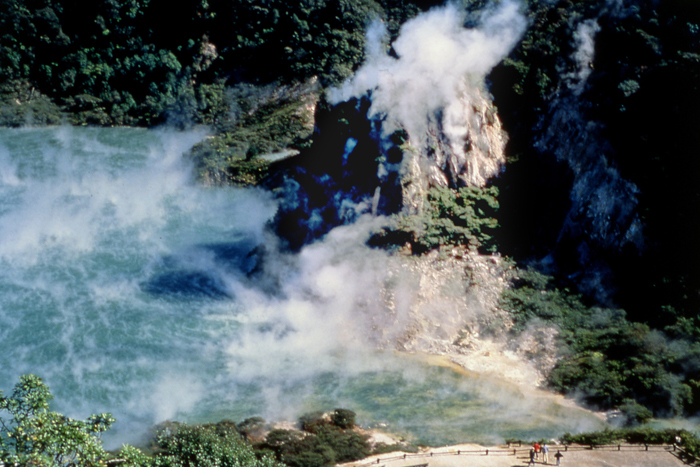 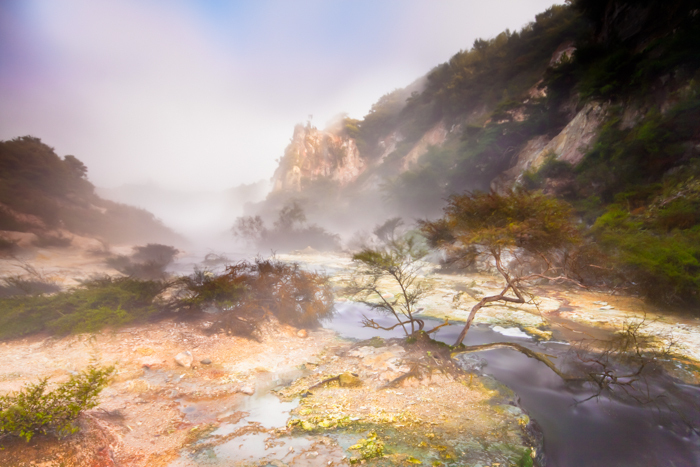 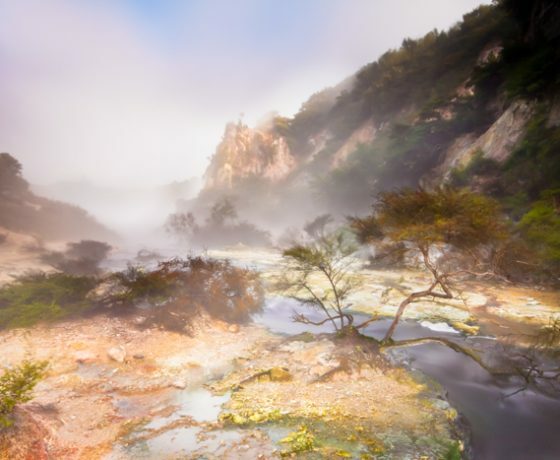 Waimangu Volcanic Valley, Rotorua is a geothermal destination for all to enjoy. 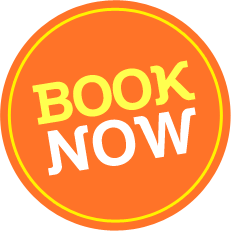 Whatever your age or fitness level, you’ll find something that suits you from our choice of easy walks, advanced hikes and boat cruise experiences, ranging in duration from 45 minutes to over 4 hours. 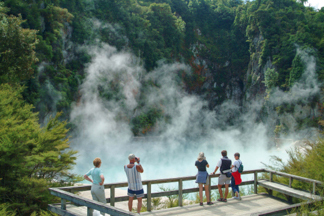 Guided tours are available for individual travellers (min 2 adults) or groups and include Rotorua transfers. 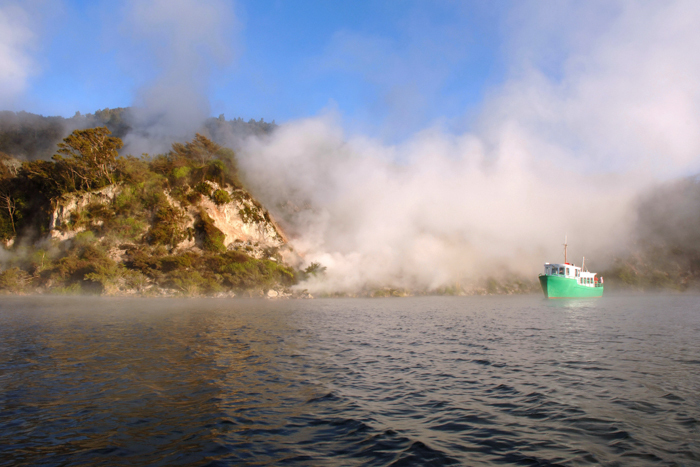 Relax on a cruise of beautiful Lake Rotomahana or take a combination of walk and cruise. 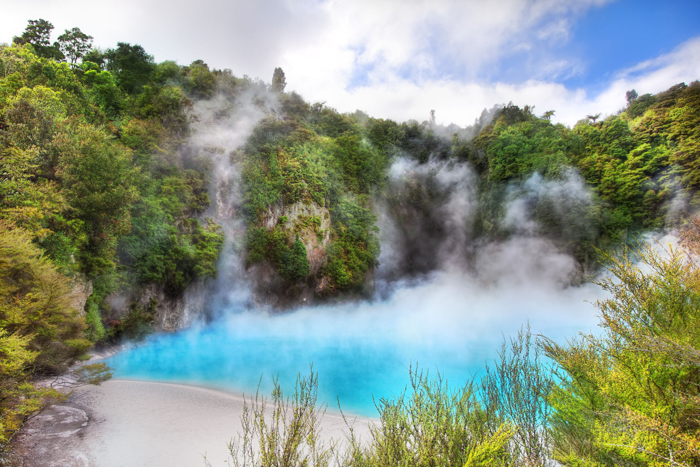 Set in serene New Zealand forest today, this amazing volcanic valley was born from the total devastation of a massive eruption. 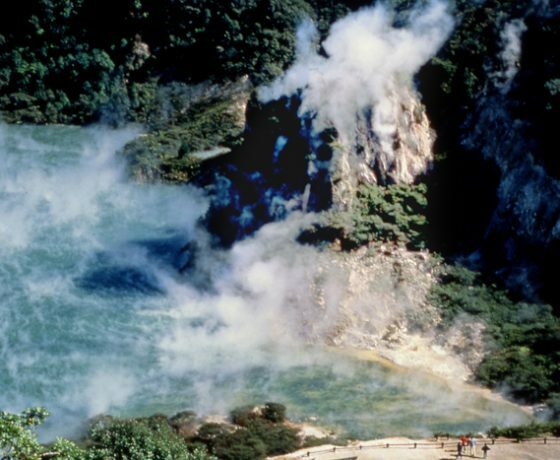 The 1886 eruption of Mount Tarawera destroyed the surrounding area, taking with it many lives. 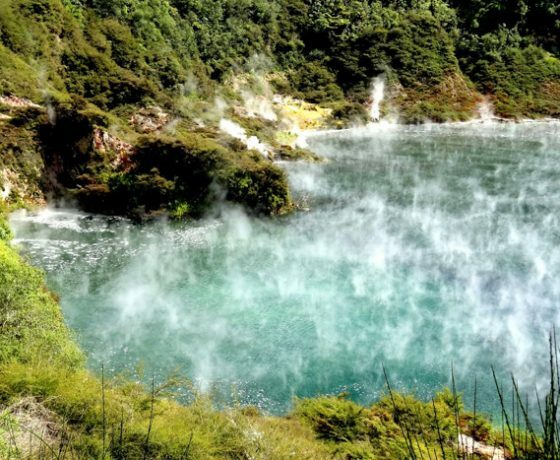 A 17-kilometre rift opened in the earth, Mount Tarawera split in two, Lake Rotomahana exploded to 20 times its size, and seven craters opened to form Waimangu Volcanic Valley. 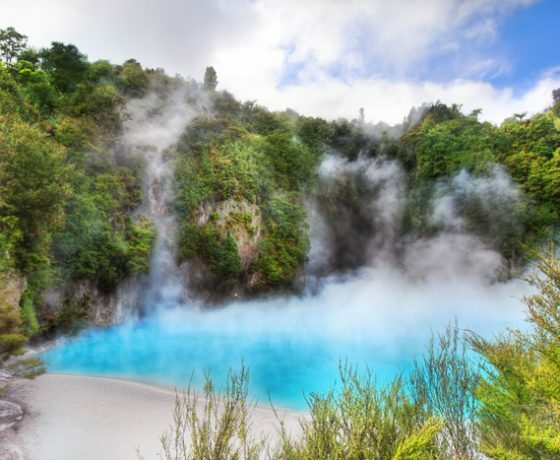 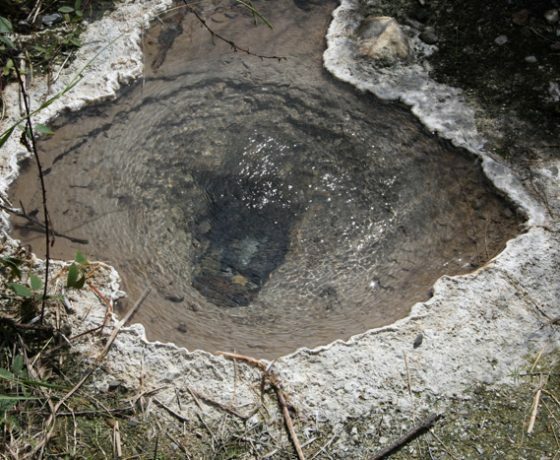 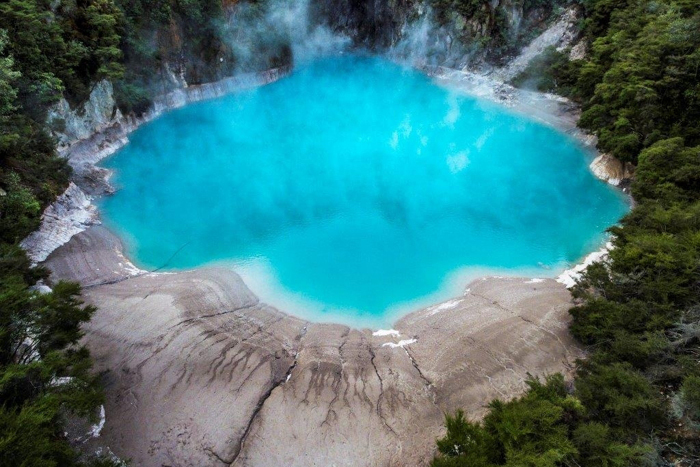 Internationally significant features at this thermal attraction include the world’s largest hot water spring, newly forming silica terraces and the unique inter-relationship between two huge hot springs in Inferno Crater and Echo Crater. 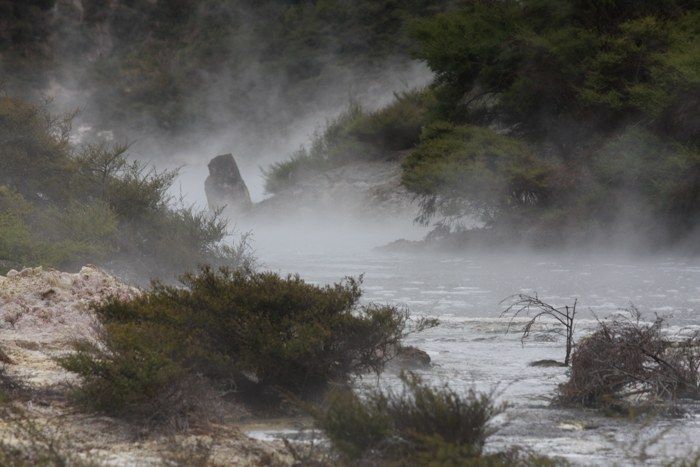 Several endangered plants exist beside the geothermal activity, as well as a large number of thermally adapted plants. 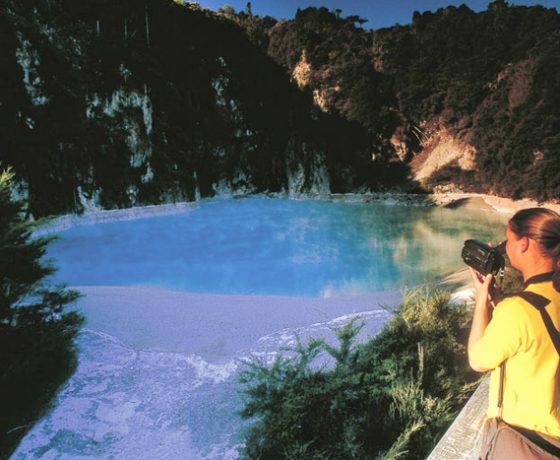 At the end of your walk and/or cruise, Waimangu’s courtesy bus is available to shuttle you back up the valley to the Waimangu Visitor Centre where you can take refreshments in a modern café (Café@Waimangu) or browse the gift shop (Gift@ Waimangu) for quality New Zealand made articles. 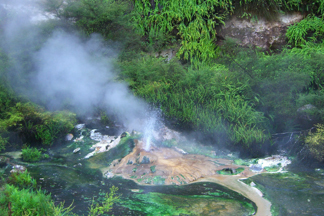 Waimangu is a unique environment of natural beauty offering a range of eco focussed nature walks showcasing volcanic activity, geothermal features, unique botany, native plants and abundant bird life. 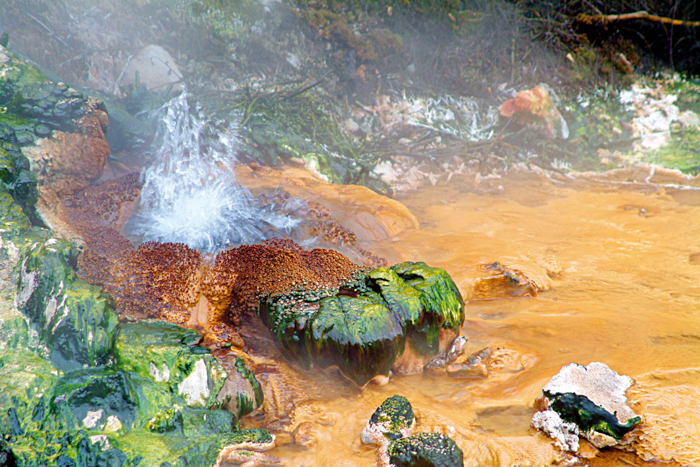 Free guide sheets in a wide variety of languages bring alive the features you discover as you walk through the valley. 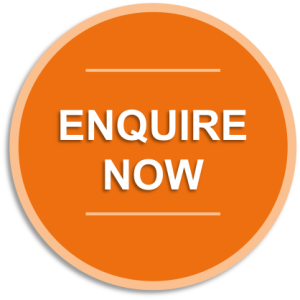 Walks are predominantly downhill, range from 45 minutes to approximately 4 hours and are suitable for all ages and levels of fitness. 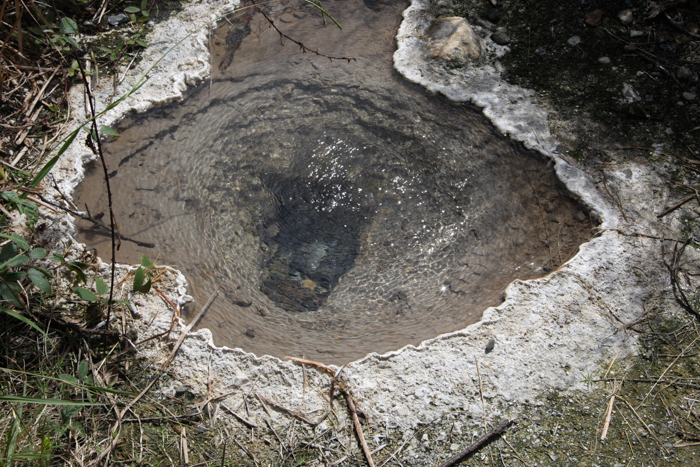 Note that the Mt Haszard trail is steep and requires a good level of fitness. 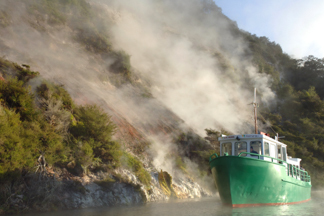 Visit Waimangu’s website for full details. 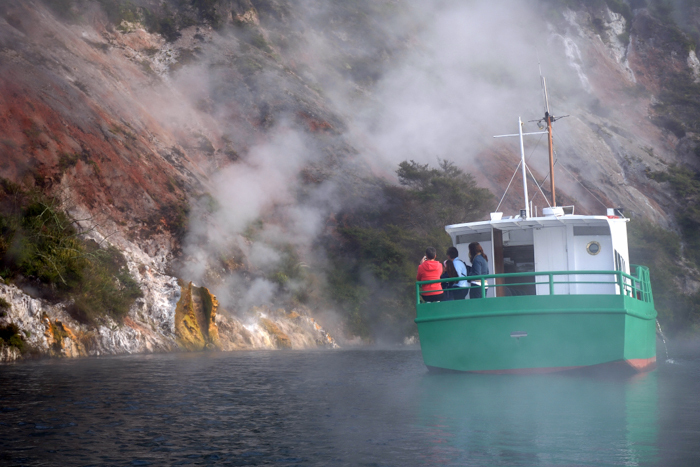 An optional add-on to your walk is a cruise on Lake Rotomahana which has its own, separate geothermal system. 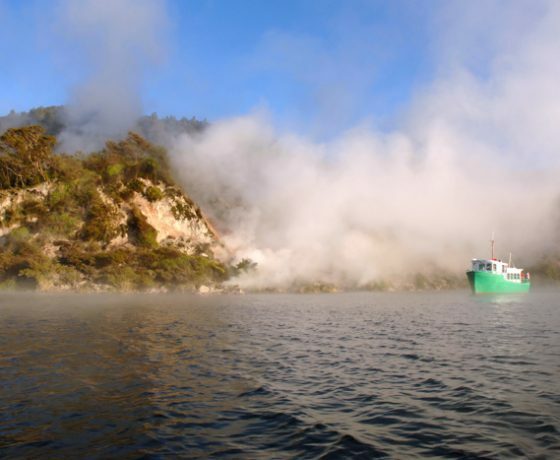 The newest of New Zealand’s naturally formed larger lakes, Lake Rotomahana is the last resting place of the Pink and White Terraces, renowned in the 19th Century as the ‘Eight Wonder of the World’. 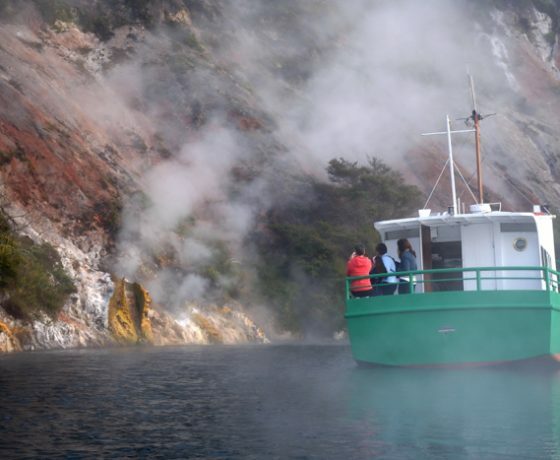 During the cruise your captain will give you an English language commentary about the lake, its history and the geothermal activity – fumaroles, geysers and hot springs – you will see on the lake edges. 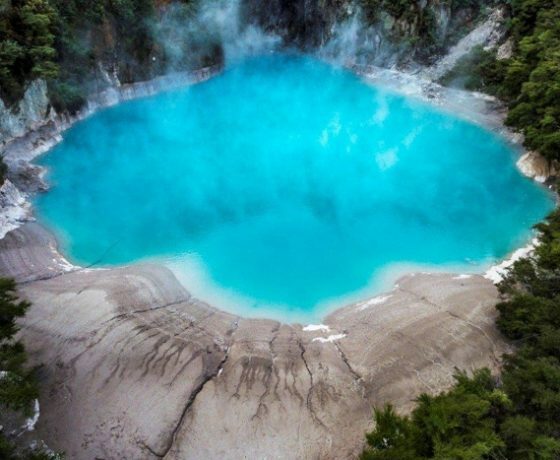 Check in: minimum 45 minutes prior to departure. If you prefer a guided tour, there is a choice of three different tours ranging from two hours to a full day. 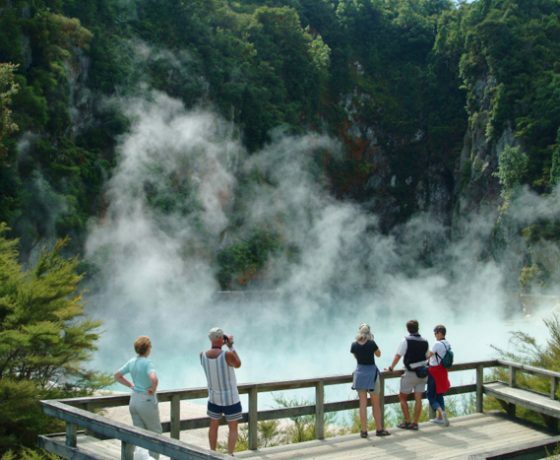 All tours include transfers to/from Rotorua city accommodation. 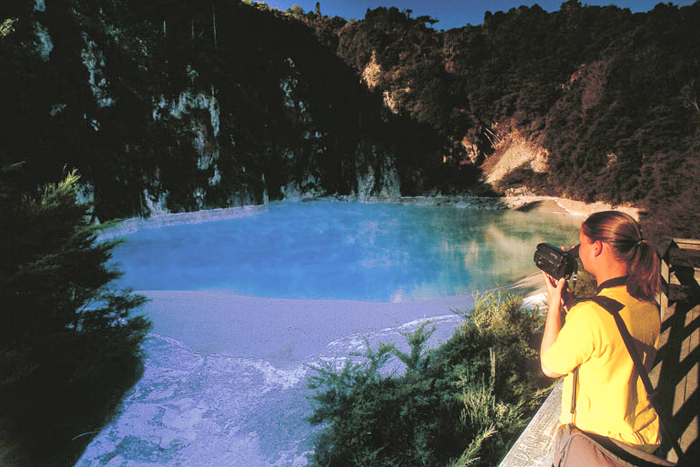 Note that these tours must be pre-booked and a minimum number of participants is required. 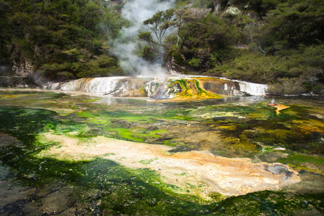 Visit Waimangu’s website for more information.